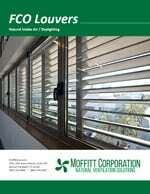 The Moffitt FCO natural intake / daylighting louver is designed with translucent blades to act both as an airflow device and a daylighting device. It is normally used for air intake, but can be used as an exhaust device. The louver frames are constructed of lightweight and corrosion resistant aluminum. The louver is normally electrically actuated, but can be manual or pneumatic. Each unit ships in factory assembled, maximum panel sizes. FCO wall louvers are mounted on the sidewall at any elevation.